New Delhi: The government will soon implement the ambitious Personal Rapid Transit or Metrino project in the National Capital Region, Transport Minister Nitin Gadkari said on Sunday. The pilot project, which will cost Rs. 800 crore, will let passengers use India’s first driverless pods – suspended on a ropeway – on a 12.3-km stretch from the Delhi-Haryana border to Badshapur via Rajiv Chowk in Delhi and IFFCO chowk and Sohna Road in Gurgaon. Mr Gadkari said that four initial tenders have been received and it will soon invite financial bids for the implementation of the project. “We are going to implement the Rs. 800-crore pilot project under NHAI (National Highways Authority of India). I had a meeting with Urban Development Minister Venkaiah Naidu and it was finally decided that we can execute it under the NHAI Act. Previously, it was being explored whether to do it under the Tramways Act or the NHAI Act,” the minister added. “Four global companies – one from London which has done work in this regard at the Heathrow airport, one from the UAE, one from the US and one from Poland have qualified in initial technical bids. Once the road transport and highways ministry approves it, we will float financial bids,” an official said. “Initially, we are planning 1,100 pods and the system will be such that if one has to travel from station 1 to 12th, on a specific command that particular pod would reach the 12th station without any halt,” the official explained. 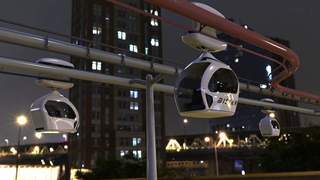 The complete public transport project for travel in driver-less pods suspended on a ropeway in NCR wil cost Rs. 4,000 crore. The first phase plans connecting the 70-km stretch from Dhaula Kuan in Delhi to Manesar in Haryana to decongest NCR and ease traffic. The ropeway system runs on electricity, and driverless pods come down at designated stations, thus shifting the traffic burden from the already congested roads. Under the project, fully automatic, driverless small pods travel independently suspended over an overhead network which is usually 5-10 meters above the ground. A few months ago, a presentation on the project was made before Prime Minister Narendra Modi and the Union Cabinet. Mr Gadkari has said the massive work is under way to reform the face of the highway sector and the pilot project will be one such step in that direction.